Buyers, Thanks for checking in with me. Please visit my new site at TollgateCanyon.com for a full list of properties and access to search the MLS. If you are still not finding what you want give me a call. Contemporary log home in Tollgate Canyon. Enjoy our cool summers and wintery winters just 15 minutes from Park City. 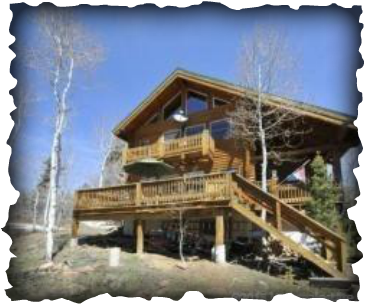 Only 55 minutes to Salt Lake City Airport and 10 minutes to Lake Rockport for your water activities. Main living area is open & inviting and spills into a large kitchen. Main floor master with hot tub located outside on the covered deck. Top floor has a loft/artist studio. Call for more information. 30 ACRES AND A GUEST HOUSE......With this amazing view!!!!! Cozy home in old growth aspens. Owner bought home and put almost 10K into grading and upgrades. Hickory cabinets in kitchen. New wonderful covered deck for sunset & wildlife watching. Loft is 3rd bedroom. Basement unfinished with one bdrm framed in. Bathroom could be added in lower level. Heat & glow propane f/p in liv rm. On plough route.